The Storage Master Elite provides storage for cars, trucks and equipment and allows full use of space right up to the sides.Extra heavy-duty frame is manufactured from 14 gauge Allied Gatorshield square steel tubing. The tall, straight sidewalls allow greater storage capability. 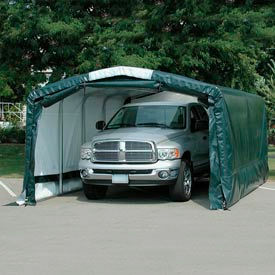 Sidewall height to bend: 9'6H UV-resistant 12.5 oz., 24 mil premium, rip-stop poly cover comes with a 15 year warranty. SolarGuard white skylight lets the sun shine in.One solid and one zippered end panel that allows the entire end to be opened and closed. To provide secure and stable holding power, Anchor Accessories recommended. Choose from Model B354301, B354299 or B381149.